Notes: Spin-off of 2006's Ayakashi: Samurai Horror Tales. This ran in summer 2007 on Fuji TV's noitaminA block. Despite its name, this series has nothing to do with the 1997 Hayao Miyazaki film Princess Mononoke. Mononoke is a spin-off of the Bakeneko story arc of Ayakashi - Japanese Classic Horror. 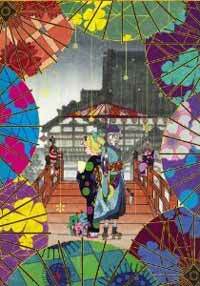 It follows the Medicine Seller as he deals with various spirits or "Mononoke" in feudal Japan. Just like in the Bakeneko story, he combats with a series of tools and his vast knowledge of the supernatural on his side, but can only kill the Mononoke when he uncovers its form (Katachi), the truth behind its appearance (Makoto) and the reason for its unusual behaviour (Kotowari). I like novelty. Having seen rather a lot of most things, it is refreshing to me to see something a little bit different, if only in execution rather than subject. To be honest, novelty in approach is more important to me than novelty in subject - some of the very best of ideas can be lost to banality of an all too conventional approach (See Angel Beats!) and it is a crying shame to say the least. When you get both things together, however, then things really get interesting. Not always good mind you, some things are not done for a good reason, but interesting nonetheless. Something I like even more than novelty is bravery. It makes me happy when makers of any media go out on a limb and do things that could as easily misfire as score a direct hit. I like shows that challenge themselves as much as they challenge the viewer and never rest on any laurels they may have gathered on the way. Pattern is a curse as much as it is a blessing to media. Mononoke surprised me. For some reason I had been expecting something rigid and unyielding, sticking closely to the methodical, repetitive style of storytelling that I expect from something that is meant to be representing 'classic' ghost stories - boring, unfeeling, uninteresting and self-important. If I had left it at the first arc then perhaps I would have been right but the second arc... well it proved me wrong. To cut a long process short, the mononoke after which each arc is named are more than just titles. The makers have managed to capture the symbolic meaning of each (everything is symbolic in the Orient the more 'classic' you get) and expressed it in not only the visuals but also the style and delivery of the story. What makes this even more impressive is the narrative restraints which the series puts itself under - making each arc completely unique in all but a few respects, despite them. The only real unifying feature is The Medicine Seller and his quest to destroy each mononoke by discovering its Form, Truth and Regret - everything else from the supporting characters to how he discovers the necessary information are completely individual and quite wonderful in the case of the last four arcs. Did I mention that the visuals are incredible? Well they are. The character designs and colourings are also well conceived and interesting, and used so appropriately in each arc that I could not help but find the artistry of it all impressive. The aesthetic appeal in each and every single arc is up there with the very best that animé has to offer in its effectiveness and often in its beauty. The grey and earthen colours of the first arc are completely in contrast of the second arc's kaleidoscope palette which in turn seem like a different show to the final arc's almost art deco design. It lets you feel the different themes, time periods and settings depicted far beyond a simple explanation and could well be a strong show's strongest point. As for negatives, I think this show was trying to be scary, or at least creepy. It isn't. Also, it suffers from a lack of investment from the viewer. As interesting as the show is, not once did I ever get caught up in it intellectually or emotionally. I never felt any concern for the cast and I was never thrust into any moments of thoughtfulness either. For all that was good about it, it never got me excited in the way that great shows, and potentially great shows, have always managed. Even the aforementioned Angel Beats! brought out more excitement and more intellectual stimulation from its core concept than this, despite being inferior to this show in pretty much every way, shape and Form, in Truth and much to my Regret. There is also the aforementioned problem that some arcs are perceivably weaker than others. It is an almost inevitable problem when you approach such arcs with individualistic glee and while the problem is not as pronounced as shows such as The Animatrix (where the individuality of each piece was wild thanks to each of them being made up of essentially separate productions), the differences in visual style and storytelling approaches that make Mononoke an excellent series are also weaknesses in their own right. I cannot tell you which arcs are the best (three and four were my personal favourites), because in discussion this seems to be a widely subjective topic, but I can promise you that there will be ups and downs for the majority of you as you watch this. Not to say that this show is ever bad, but at points it is merely pretty good. Recommended Audience: Probably best for adults or at least older teens. There is violence and many of the themes are very adult. It varies from arc to arc but it is pretty unpleasant at its worst.